We have constantly updated and tweaked our design to work with every possible high performance configuration you may see in your BMW. Real world tested and proven over thousands and thousands of miles of all out race use. Works great for Dry Sump, Accu-sump, or Wet Sump configurations. Offer ease of service on and off the track, and works great with N/A, supercharger, or Turbo applications. Our housing is made from finely finished 6061 T6 aluminum. The two piece design allows direct replacement of factory housing and maintains alternator and power steering in their original locations. 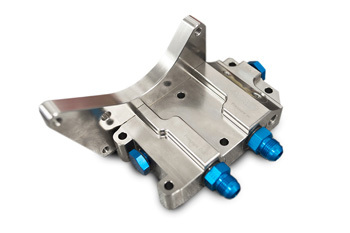 Designed for compatibility with our VAC Dry Sump Kit. Allows easy install of Accusump systems. Provides oil temp, oil pressure, and VANOS line ports. The 2 pieces come fully assembled and supplied with AN fittings and P/S Pump Spacers. A full two pounds lighter than factory housing. Allows for easy service of components beneath intake manifold. Click link for our Filter Housing tech article.